Even the shortest taxi journey will cost you a minimum of AED 10. The Dubai Sherpas have made numerous Dubai taxi journeys to help you on your way. We’re updating the information on taxis in Dubai after the recent app. What are your views on the Dubai taxis smartphone app? Have you used it, does it work? What do you think of the taxi service, the drivers etc etc? except that there are no purple-roofed taxis in Dubai! Of course, Dubai also has blue hybrid taxis, some green taxis and some people carriers. 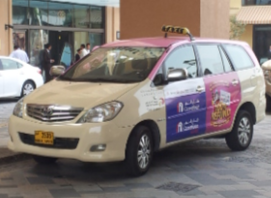 Ladies – check out the pink roofed taxis which are especially for you and driven by a lady. Ladies can order by phoning or they’re always at the airport waiting for you! To call a Dubai taxi dial 04 208 0808. There’s another taxi service – hala. A taxi driver cannot refuse to take you to your destination. Some drivers come up with all sorts of stories – don’t be put off. The best way to go about hiring a taxi in the street is to flag the taxi down and then hop in the back seat before saying anything to the driver. Makes life slightly easier. The minimum fare is AED 10 – even if you only take the taxi from one end of the street to another. Do not treat the taxi driver badly. They work long hours so be kind. If the taxi driver is speeding (the maximum speed limit is 100 kph on the major highways) or driving carelessly you have every right to ask him to slow down. You also have the right to tell a taxi driver not to use his mobile phone when he’s driving. Illegal and very dangerous. Wear your seatbelt. Don’t expect the driver to remind you to belt up! Do not smoke in a taxi. Your taxi journey will be metered. Salik (road toll on Sheikh Zayed Road) will be charged to you as the passenger. Always ask for a receipt – make it a habit. If you happen to forget anything in the taxi or if you want to contact the taxi services regarding your journey all the details are on the receipt.